In the late 1980s, Pier Luigi Loro Piana was in a bind. As a chief executive of the Italian luxury-fashion company Loro Piana, he wanted to offer his customers the finest animal fiber in the world: the hair of the vicuña, a small llama-like creature native to the high plains of the Peruvian Andes. The problem was that the animal was listed as endangered, its fleece subject to an international embargo. The solution he came up with was to become involved in the animal's protection. 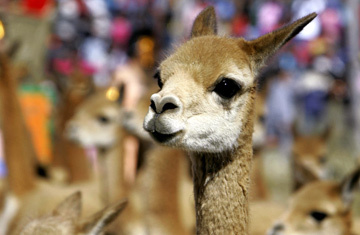 Until the embargo, which had been put in place in the 1970s, the vicuña had been at risk of being hunted to extinction. Its hair, finer than the softest cashmere, fetched high prices on the global market. (Loro Piana's father Franco had been among the first to import it to Italy.) But the demand had at one point cut the total population to just 5,000. And while the ban on exportation allowed the numbers to rebound, there was little chance the hunt would be permitted again. The answer, he decided, was to partner with the government of Peru to develop a new way to harvest the vicuña's hair. Instead of the animal's being killed for its fleece, it would be sheared like a sheep. The company would get the raw material to make its coats, scarves and sweaters. The Peruvians would be blessed with a new source of income. And best of all, the vicuña would continue to recover. "We needed to find a socioeconomic role for the animals to give the local Peruvians an incentive to protect them," says Loro Piana. "A live vicuña needed to be worth more than a dead one." Call it an act of selfish environmentalism. In 1994 the Italian firm became the majority partner in a consortium, the first organization since the ban to be allowed to buy, export and market the luxury fiber. Today the company runs a 2,000-hectare reserve dedicated to the preservation and study of the vicuña. Across the entire Andes, the animal's population is nearing 200,000. Once every two years, those in Peru are gathered for shearing. The rest of the time, they range wild. Loro Piana isn't the only company that has turned green in service of its bottom line. Just as its chief executive realized that without the vicuña, there would be no vicuña scarves, other executives around the world are becoming aware that ecological degradation has the potential to put their businesses at risk. "A lot of companies start out with the environment as a way to look good," says Phil Radford, executive director of Greenpeace USA. "Then they find out there are both reputational and financial gains." For Coca-Cola, that realization came in the mid-2000s, when the global beverage giant became entangled in a controversy over its water use at a bottling plant in India. Nearby villagers held the company responsible for a dramatic drop in the level of the region's groundwater. Their demonstrations caught the attention of environmental activists, and the resulting negative publicity sparked protests and boycotts at college campuses across the U.S. and Europe. Coming as it did at a time when the company was expanding its pure-water products like mineral water, the unrest rang as a warning. In the future, Coca-Cola's fortunes would be tied to those of the environment. Today Coca-Cola maintains a database combining water-flow data with predictions for population growth, economic development and climate change, giving it an idea of the challenges its various plants can expect to face in the coming century. It has asked all its facilities to map out a water plan, to understand where their supply comes from and what they can do to protect it. "Because we operate in all but three countries, we're somewhat a canary in a coal mine," says Greg Koch, director of the company's global water-stewardship program. "We're seeing water stress manifest itself in all types of places and in all types of ways."